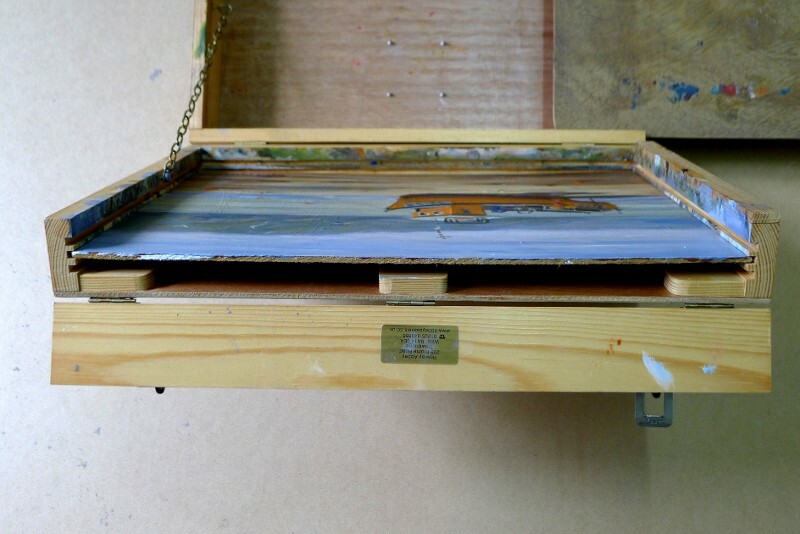 1) It has a hinged lid that acts as an easel and holds your canvas or board or other support, for painting on. 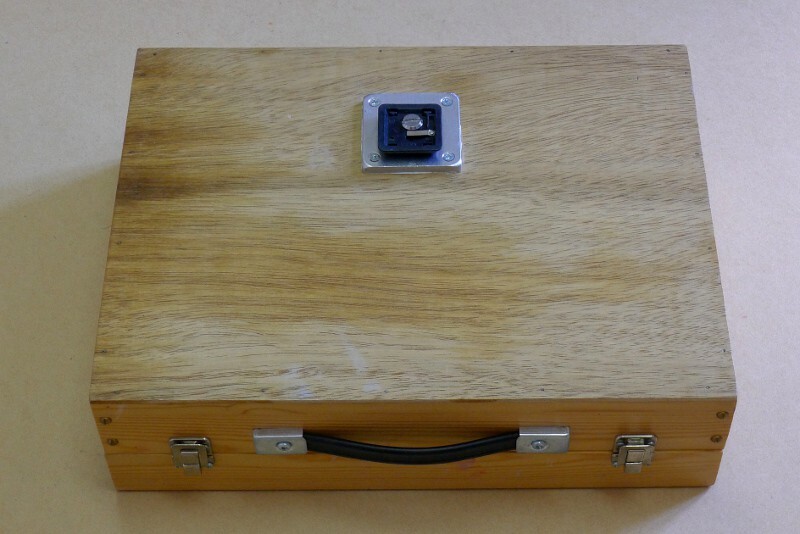 2) It has a palette contained within it. 3) It has storage space for all of your brushes, paints, thinners, e.t.c. There are many sizes of pochade box available, from tiny pocket-size ones, to ones much larger than my own. The one below, I have had for years, and it can take up to three 14 x 10 inch painting boards, which slide into slots in the lid section. It’s an excellent pochade box, and was hand made by Rowley Abbey, of Abbey Easels – see my pochade box in action here. The palette slides in and out, in a slot build into the main body, and is designed with enough gap that when the lid is closed the paint on the palette doesn’t touch the paintings slotted into the lid. 3 grooves to accept painting boards. 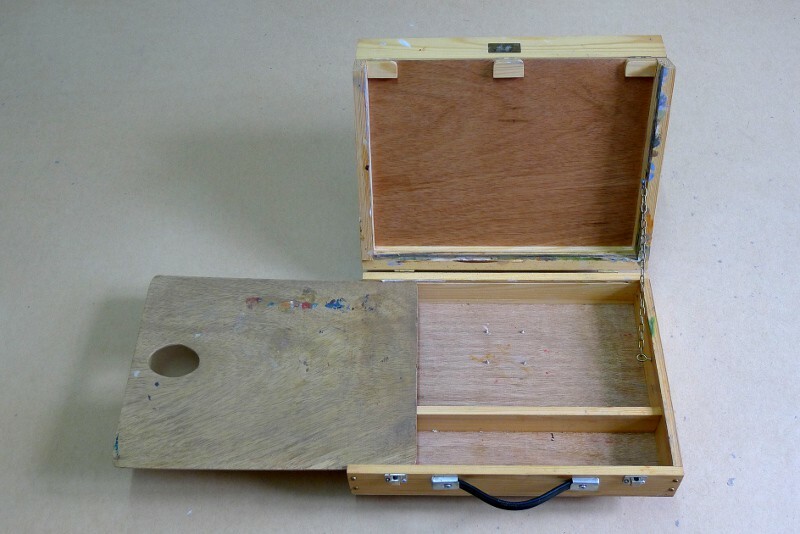 The hinged top opens to reveal three slots that your painting boards slide into. As you paint on each board, you can rotate the order, moving the back board to the front, front board to the middle e.t.c, ..and there is enough separation between each of the boards to ensure that they don’t touch and damage your wet paintings. Pochade box with camera tripod adaptor bracket fitted. If you want to attach your pochade box to an easel or tripod, you’ll need one of these brackets. I bought this camera tripod adaptor bracket from Ken Bromley art supplies, and fitted it to the underside of my pochade box myself. 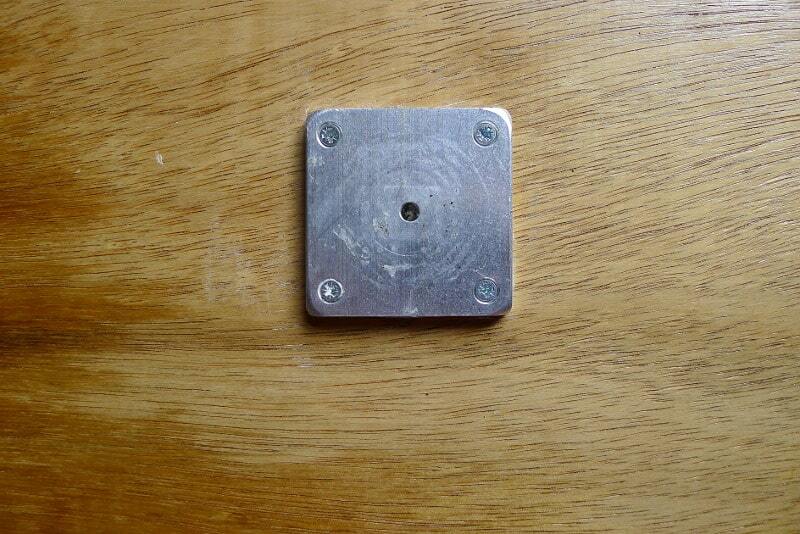 It’s just 4 screws and a bit of glue, dead easy ( see this bracket in use in the video toward the bottom of this post ). Pochade box 1/4 inch threaded camera tripod adaptor bracket close-up. Here’s the bracket on it’s own, with the tripod fast-fix taken out. In the image above this one you can see the black plastic piece, which is actually a part of my camera tripod, and it’s the piece that has the 1/4 inch threaded screw attached. 1/4 inch is the standard size for tripod adaptors worldwide ( as far as I am aware ) so the bracket should fit any tripod. Painting in my garden using my pochade box. Here’s the whole set up in use, taken when I was doing a little painting in my garden last summer. If I have a nice surface like this table to paint on I tend not to put my brushes e.t.c away in my pochade box, as you can see. I didn’t need to use my camera tripod here either of course. Painting with my pochade box in the West Wales landscape. 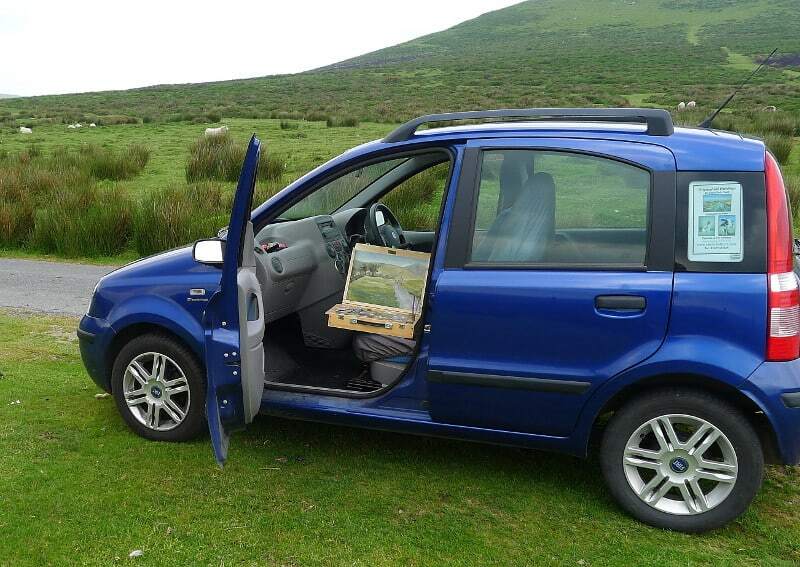 I paint all over Wales using my pochade box, sometimes sitting in the passenger seat of my car painting with my pochade box on my lap, as I did here. My pochade box mounted on my camera tripod using the above bracket. Turn your speakers up! In this video I’m painting high up in Pembrokeshire’s Preseli mountains, here in west Wales, and I attached my pochade box to my tripod using the bracket system described above. As you’ll see in the video, it was a bit windy up there, in fact, it was blowing a complete gale, so my whole setup was blowing about a bit ..but it was still great fun. If you’re having your pochade box hand made, and you’re left-handed, like me, have the chain securing the top, on the right side, and the palette slide out to the left. If you’re right handed, the opposite is best. In this video I’m painting from the comfort of my car, just sitting in the passenger seat to make room for my pochade box to sit on my lap. You’ll notice I have a pot of thinners ( white spirit ) sitting in my pochade box in this video, it sits snugly in one side, then I slide the palette across to secure it. 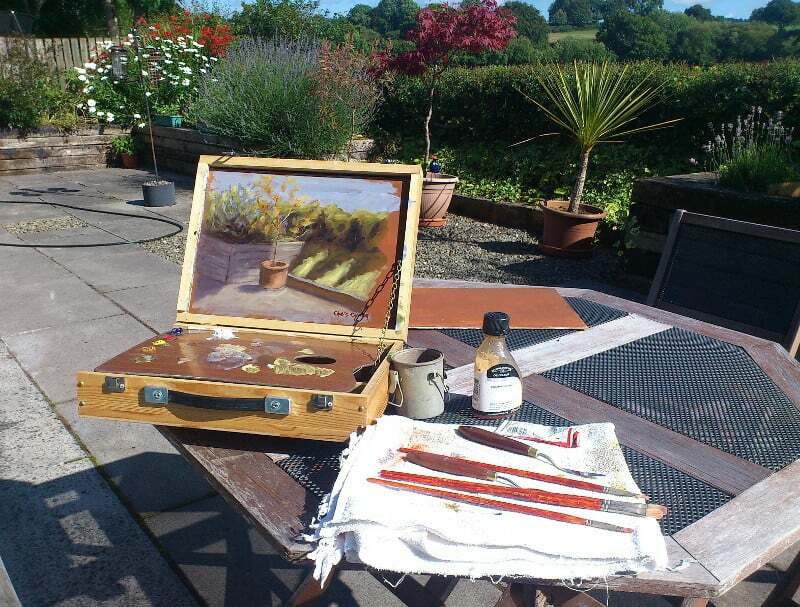 For smaller outdoor work or painting plein air a pochade box is more flexible than using a outdoor easel. There is very little equipment involved, just a few brushes, 4 or 5 tubes of paint, some thinners and a couple of MDF boards, and you’re good to go. If you have your own tips or advice for painting using a pochade box, please let us know in the comments section below, I look forward to reading them. You can watch some more painting videos here. Bookmark this article What Is A Pochade Box? ..And How Do You Use One? I’ve been after a pochade box like yours for some time but have been unable to locate one. I’ve visited GOOD art shops, ‘Googled’ it and not found anything. Hopefully you can give some suggestions. You can get one like mine from http://www.abbeyseasels.co.uk/products.html They have a selection on their website, they’re good quality, I recommend them. I like the one for pastels (or watercolour pencils or what-have-you) I’ve just bought on Amazon.com. Designed in California and made in Taiwan. Has an adjustable easel, and foam protection for pastels, etc. (I love all the water-soluble media and rarely draw/paint with only one.) Very reasonable in my opinion at roughly $139 USD. This is a really helpful post thank you! I am currently deciding between buying the Mabef 105 pochade box and one like yours from Abbey Easels and really like that the Abbey Easels pochade box is so lightweight. I am hoping you can help with a couple of questions. Please could you advise on how sturdy the chain is – is the pochade lid affected by strong wind or easily knocked? And how easy it is to adjust the angle? Also, does slotting the panel into the grooves mean some of the painting space is lost, if so how much? Hi Ella, I have never used a Mabef 105 pochade box, but the Abbey Easels ones are super. 1) The chain is very sturdy, unbreakable in normal use I’d say. The lid is also very stable, however in high wind it would be possible for it to blow shut, should the wind be in the right ( wrong ) direction. This could be remedied by propping a spare paint brush against it I dare say. 2) The angle of the lid can be adjusted by shortening the chain, by placing a different link over the retaining hook/eye, although this may have to be worked out at home first ( When you order from Abbey you can state which side you’d like the chain fitted, I’m left-handed and so hand my chain fitted on the right ). 3) The lid hold 3 panels, very little room is lost when the panels are inserted as you can put the panel you are working on, in the front slots, moving the other panels to the rear. Just invested in a pochade box like yours from Abbey Easels. It’s great, but a quick question. Do you paint on other size boards with it other than the 14″ x 10″ than it takes. Not sure how the wedges come into it. You either slide the boards out and paint the side afterwards, or leave the white strips there as they would be hidden once the painting were framed, Akhil.